On this course you will spend the day in my home in Staffordshire creating your own textile piece inspired by our wonderful British countryside. If you'd like to learn how I create my stitched trees and fabric fields, this workshop is for you! This workshop is suitable for those who have already done some free-motion embroidery and would now like to improve their free-motion embroidery skills. I will be teaching a variety of techniques that you will be able to use to create your design. There will be plenty of inspiration available for you - I have created many textile pieces inspired by our British landscapes. If you are new to free motion embroidery I'd recommend starting with my Flowers and Grasses Workshop. Free motion embroidery is an exciting technique where you are able to 'draw' with the sewing machine by lowering the feed dogs and moving the fabric around under the needle. It is also known as freehand sewing and thread painting. This is a technique that I have really refined over the years and I use it in all my textile pieces. I have a lot of experience in free-motion embroidery and you will learn how to use the sewing machine to its full potential - you'll be amazed at the results! You will spend the morning learning different techniques from my demonstrations, then putting them into practice. After lunch you will make your finished piece to take home at the end of the day. All fabrics will be supplied but feel free to bring your own thin fabrics if you have a particular colour scheme in mind. Thin fabrics include cottons such as patchwork and quilting fabrics or shirt material. 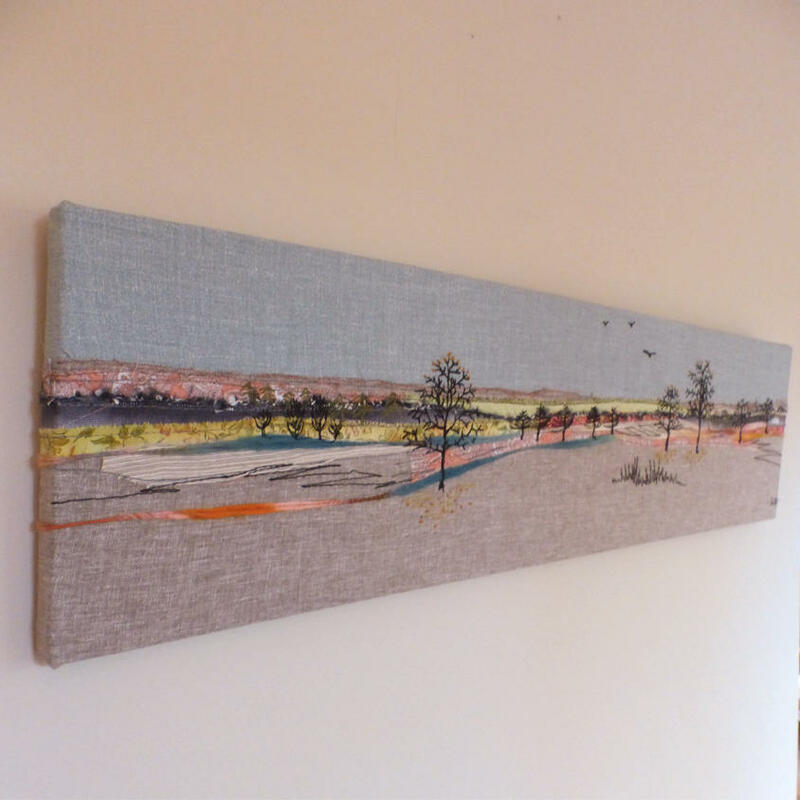 See the photos for examples of original textile landscapes from my handmade collection, plus images from previous workshops. "This was my third visit to Jo's lovely studio. Once again, it was a fantastic day. Jo and Lydia make you so welcome and cater for your every need (i.e. the spare sewing machine when I left my electrics bit at home!!). Jo's tuition is excellent and she explains and demonstrates everything as she goes along. I can't wait for my next visit. Thank you"
"I absolutely loved this course. Jo is a talented and imaginative artist. Her excellent tutoring meant that the instructions were clear and set at a good pace. She didn’t intrude but was always available to help. Would thoroughly recommend a course with Jo. Looking forward to doing another course." Please bring your sewing machine, packed lunch general sewing kit, sharp scissors and an embroidery hoop measuring 7" or 8" in diameter and 1cm deep.